Evercool has long been a producer of quality products in a number of different computing fields including PCs, industrial computers, and telecommunications. Evercool has been using the latest technology to provide the highest quality PC thermal solutions since 1991. In its latest venture into cooling Evercool has created the F117 Nighthawk Universal VGA Cooler. With a crafty, sharp looking design that resembles the state of the art fighter jet, the F117 should prove to be a pretty solid product. Evercool has provided me with one for review, so let's take a look at how it performs. • Compatible for all kinds of ATI & nVIDIA VGA cards. • All cooper design provides the super performance. 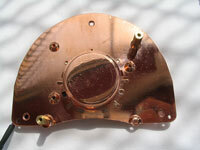 • Extra 8pcs heatsinks included. • Fantastic red LED type. • VC-F117 Nighthawk sharp form design. The Evercool F117 Nighthawk came packaged in the usual tough plastic shell, providing adequate protection during shipping and retail sale. The packaging was colorful and would easily catch one's attention walking through a store. 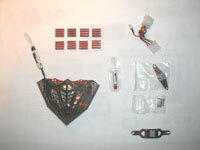 Included in the kit are the GPU cooler and eight (8) RAM heat sinks to further dissipate the heat from your video card. Along with the RAM heat sinks, Evercool provides you with thermal compound, two mounting brackets for the fitting of almost every popular board. A bag of hardware is also provided along with a molex patch cable. 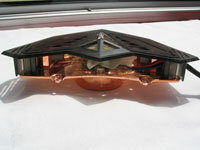 Taking a look at the underside of the fan unit, it is easy to see that Evercool has done a great job designing the F117. 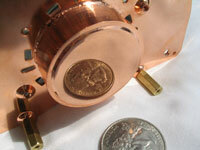 There is a large copper base to provide clearance over any obstacles you may have on your board such as large capacitors. A perfect finish has been put on the base of the VGA cooler, evidence lies in the photos below. A protective sticker also protects the base from any scratches during shipping.You can also see the five different hole locations for the provided spacers, a maximum of two will be used depending on which graphics card you are using. From the front, you can see the fins that make the cooler such a good performer. 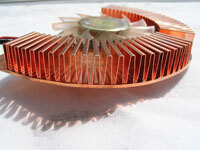 It seems as though the fins are actually just one piece of copper folded into waves to create the proper heat dissipation. I didn't find any problems with this and it provided adequate efficiency. From the back you can see two locations for screwing in the spacers, the provided fan is also visible from this angle.